"Aim for the Ace!" 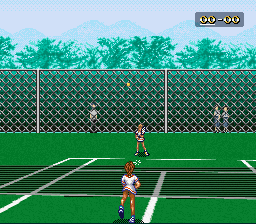 is, surprisingly, the only game ever made that's based on the classic 1970's manga, "Ace wo Nerae!" by Sumika Yamamoto, and the three popular TV anime series, one movie, and one OVA series that were adopted from it. 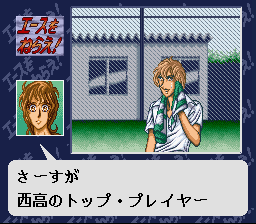 In this game, you play as Hiromi Oka, a student at Nishi High. She is only a beginner but has great aspirations to get to the top. Soon she realizes her natural talent and, combined with her coach Jin's training, she's able to compete on the same level as her idol Madam Butterfly, and win. 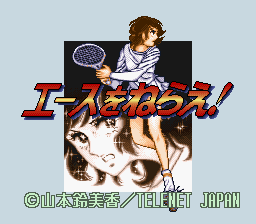 Help Hiromi achieve her destiny by defeating all her opponents in this exciting and challenging pseudo-3D tennis game that all fans of the anime and tennis fans in general should try out! 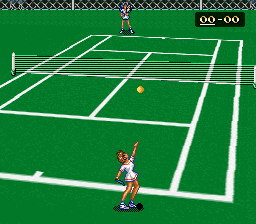 This game is sometimes written as Ace wo Nerae! 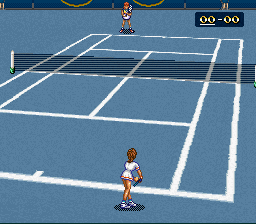 ; this is the GoodSNES and NSRT title. Go to Scenario and enter these at the Passwords screen.